Government claims that 11,000 fewer cars are in Belfast city centre every day due to a major overhaul of the traffic system have been rubbished by a prominent councillor. Critics of the Belfast On The Move project – which saw the introduction of 2.6km of new bus lanes on main thoroughfares – claim that congestion in and around the city centre has become worse since the launch of the initiative. And an independent study on road congestion has named Belfast as the most congested city in the UK, even ranking ahead of London. The Department for Regional Development said an impact study on its Belfast On The Move project found that 11,000 fewer cars were in the city centre streets daily, and 2,000 more people were entering the city centre each morning. According to the study, over the last two years there has been a 40% increase in bus-based park and ride usage serving the city centre, as well as a 36% rise in train users, 19% more cyclists and 12% more pedestrians. Regional Development Minister Danny Kennedy said that changes made to streets in the heart of Belfast had led to "fewer vehicles... with the associated reductions in traffic flows through inner city residential areas". He added: "This has improved the environment for shoppers, workers, residents and visitors." However, Jim Rodgers, a member of Belfast City Council's town planning committee, said: "There is no way there are 11,000 fewer cars in the city each day. I'd like to know how that figure was arrived at. I've said it before and I say it again, this project should not be called Belfast On The Move, it should be called 'Belfast Grinds To A Halt'." Mr Rodgers added that since the new bus lanes were introduced shoppers were choosing to go elsewhere. "The congestion has become worse because of the bus lanes. It has become a real nightmare and an independent review must be carried out. If you speak to the traders they will tell you footfall has reduced because people are disgusted by the new traffic system," he claimed. Mr Rodgers added: "Belfast is suffering because of this. People are choosing to go elsewhere to places like Sprucefield for their shopping." But Glyn Roberts, of the Northern Ireland Independent Retail Trade Association, said that while congestion was still a problem, it was improving. He added that he didn't believe the Belfast On The Move initiative has had a negative impact on the number of people visiting the city centre. "I think we have some way to go before we address the problem of congestion into and around the city but we are certainly moving in the right direction. In terms of footfall, there has been no reduction," he said. The latest TomTom Traffic index on road congestion found that Belfast was the most congested UK city with travel times 36% longer than they would be in free-flowing conditions. 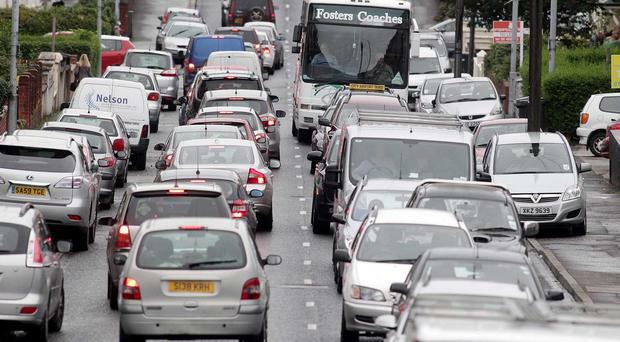 The findings placed Belfast ahead of London and Edinburgh as the city with the most traffic jams. The Belfast On The Move project was launched in 2012, giving priority to public transport, pedestrians and cyclists. Its launch did not run smoothly with motorists facing major rush hour delays when the new bus lanes began operating. According to the Department for Regional Development, the initiative has led to 11,000 fewer vehicles driving through the city centre each day. Belfast motorists still need convincing that the city is "on the move". At rush hour in the city yesterday, as cars began to line up bumper to bumper, drivers were far from satisfied with their journey. Kathy McAuley (38) from Carrickfergus said waiting in traffic jams was a "nightmare". "We have new road lanes which doesn't help. With the bus lanes the cars don't drive on them anyway – mornings are the worst. "I leave earlier in the morning to avoid rush hour." Her passenger said she didn't drive in Belfast because it was too much hassle. Meanwhile, Brian Curry (51) from Glengormley described his morning commute as "chock-a-block". "We would avoid the city just because of the traffic," he said. "Some mornings we can hardly get moving because it's chock-a-block. "The bus lanes are a waste of time. It's added more congestion than anything else. It's as bad as ever, there is just far too much traffic on the road." Paula Baxter from Newtownabbey said it can take her 45 minutes to travel seven miles. "I come along the M2 and come off at Duncrue and it's extremely busy. The problem is more that people are sitting in the middle lane hogging it at 50mph. "I never really drive through other cities, but going to England and other cities, their infrastructure is so much better. "It is horrendous. I was off today but I left it until 10am to come in to the city centre." Maria Daly (50) from Glengormley said she can travel to Ballymena faster than she can travel to the Ormeau Road from her home.